Did you know that you can spread decay-causing bacteria to your child with a kiss or by sharing food? It’s true. Dental caries (tooth decay or cavities) is the most widespread childhood disease. Here’s the good news: as a concerned and loving parent, you don’t have to stop kissing your baby! Most parents don’t know that when baby teeth (primary or milk teeth) get a cavity, the bacteria can cause pain, an abscess, infection, or even spread to the un-erupted permanent teeth that lie beneath. You should take steps to prevent decay from forming, and always address existing tooth decay, even in primary teeth. In children, tooth loss caused by decay appears closely linked to poor speech development, lack of concentration, low self-esteem, and an overall inability to thrive. Taking good care of your child’s health includes preventive and restorative dentistry, as needed. I’m Dr. Peter Pate, a family dentist in Atlanta. At Dentistry in Buckhead, my team will work with you, providing the information, tools, and guidance you and your children need for great oral health. In addition to regular 6-month check-ups for children, here are treatments that we routinely perform to help prevent the spread of decay in your child’s mouth. Sealants – Dental sealants are clear plastic coatings that we paint onto children’s back teeth. The sealants dry, harden, and create a transparent but effective barrier against starches and sugars that cause tooth decay. Back teeth are hard to brush and floss, so sealants provide an extra measure of protection. Over time, the sealants dissolve, so they do not have to be removed. Sealants have been used for years and are completely safe. Fluoride – While there is some controversy over the use of fluoride in dentistry, we stand by the facts. Low levels of fluoride can deter tooth decay. Many city water supplies are fluoridated, but bottled water is not. 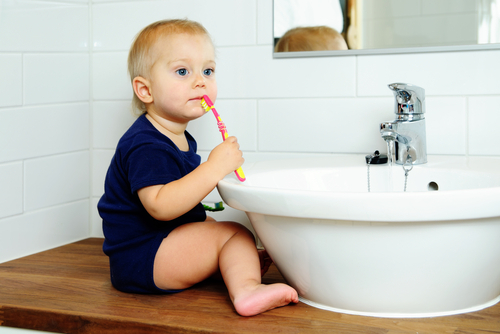 It’s important that you and your children receive ample fluoride to ward off dental caries. Fluoride is a naturally-occurring mineral that attracts other minerals to strengthen tooth enamel. We offer a simple fluoride supplement in mouth rinse form. Fillings – If you think there’s no need to fill your child’s cavities, you’re wrong. I say this with all compassion and sincerity: I want your children to enjoy comfortable, functional, healthy mouths throughout their lives. At your child’s checkup, I will alert you if I find cavities, then explain the best options for treatment. Call Dentistry in Buckhead today if you live in the Atlanta area and would like a family dentist who understands parenting firsthand. My wife works in the practice, and my son is the light of our lives. I know that you want the best for your kids, and I’ll help you by providing excellent dental care in an inviting, comforting atmosphere. Call 404-266-9424 and schedule your family’s checkups today.